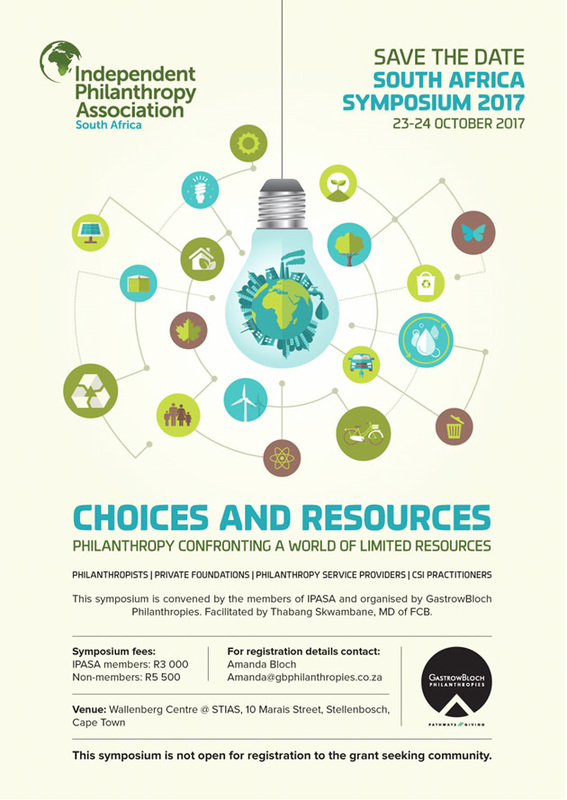 The theme of the 2017 IPASA symposium is CHOICES AND RESOURCES : Philanthropy Confronting a World of Limited Resources. This symposium will provide the philanthropic and grantmaking sectors with new thinking related to the contributions that can be made in future in a context of limted resources. This symposium will explore social capital and cohesion as valuable resources, natural capital and the power of collaboration between different sectors. The symposium will end with a session focusing on reimagining South Africa and how its resources could be better employed to respond to a new vision for the country. The symposium will be held on 23 and 24 October 2017 at The Stellenbosch Institute for Advanced Study in South Africa (STIAS) in Stellenbosch, Western Cape, South Africa. The symposium fee for IPASA members is R3 000 and the symposium fee for non-members is R5 500. To register please CLICK HERE. To view the IPASA Symposium 2017 Draft Programme please CLICK HERE. © Copyright 2016. Independent Philanthropy Association South Africa. All rights reserved.